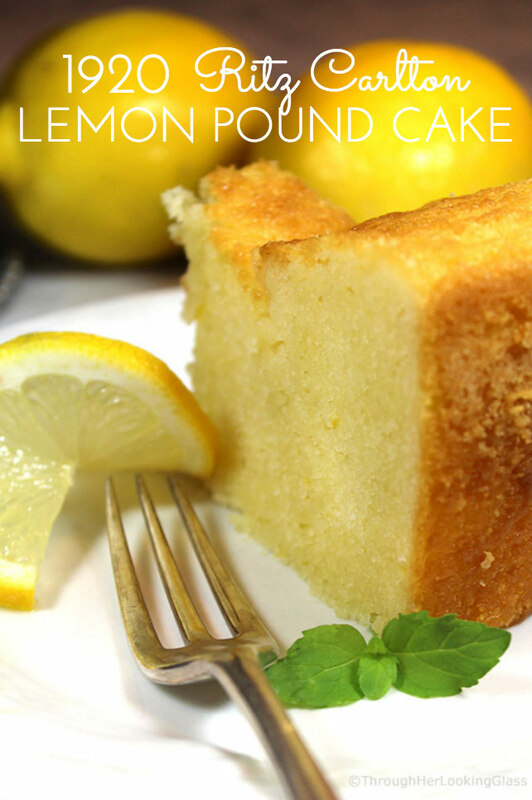 If you love lemons and you love pound cake, this 1920 Famous Ritz Carlton Lemon Pound Cake Recipe is calling your name! This dense, old-fashioned buttery lemon pound cake was a favorite at the Ritz Carlton Hotel in the 1920’s and it’s still popular today. There are several other pound cake recipes here on the blog you may enjoy: Blueberry, Glazed Lemon Blueberry, Fresh Peach and Sugared Cranberry. Each is unique and I don’t like playing favorites. 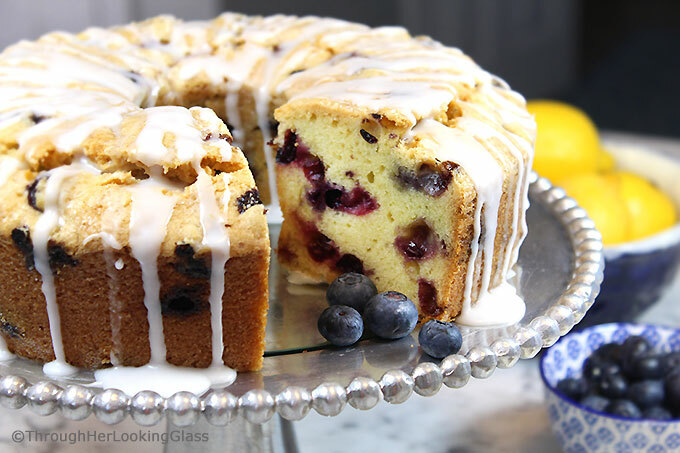 But if you ask me today, the Lemon Glazed Lemon Blueberry Pound Cake would be right up there. The Sugared Cranberry Pound Cake is so pretty at Christmas time too. Classic pound cakes are pretty simple to make. Traditionally you cream the butter or shortening with the sugar first. Then add in the eggs, one at a time. But the first time I made this 1920 Famous Ritz Carlton Lemon Pound Cake Recipe, somehow I doubled the shortening. Why? Dunno. I didn’t even realize about the extra half cup of shortening until my kitchen started filling with smoke about half way through the baking time. Eek! The extra oil was seeping out the bottom of my two part tube cake pan and smoking from the bottom of the oven. So do as I say. (And not as I did.) And pay close attention to your ingredient amounts! 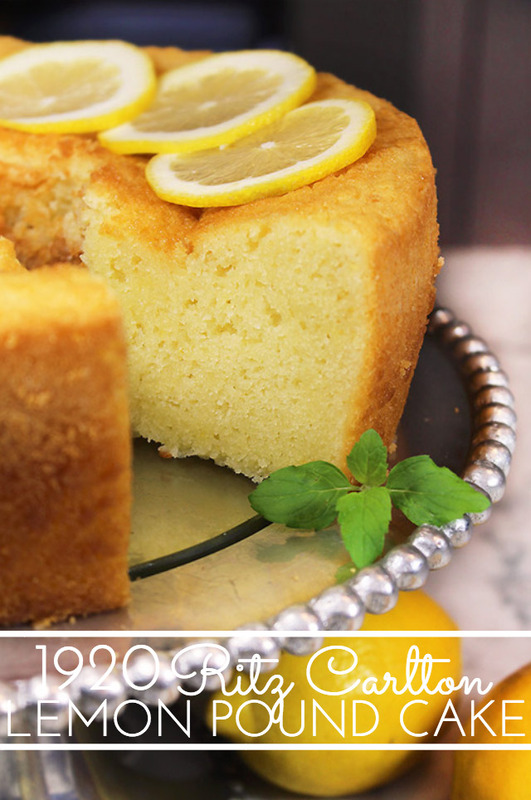 The recipe for this 1920 Famous Ritz Carlton Lemon Pound Cake Recipe has been floating around the web for years. I love that the recipe is simple. 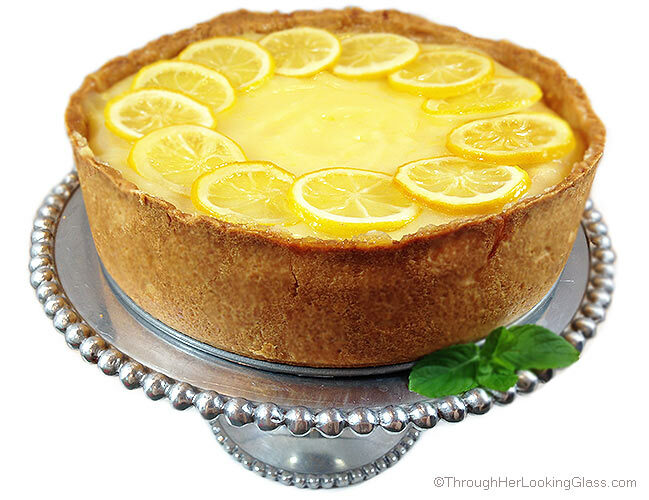 It’s scrumptious served with a generous dollop of whipped cream or a spoonful of lemon curd. The second time I made this pound cake was the charm. I laid out all the ingredients before I starting mixing, and carefully read through the amounts. Not exactly rocket science, but I didn’t want to smoke out my new kitchen again. For a tender cake, don’t over mix. Mix until ingredients are just incorporated. Bake on your middle oven rack. 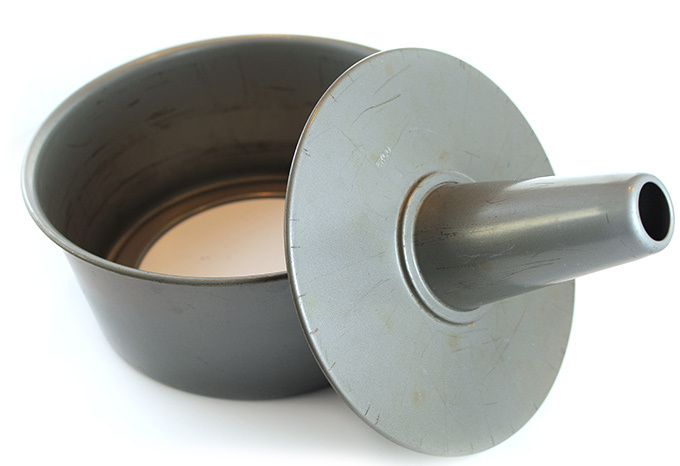 Grease and flour a bundt pan or tube cake pan. This is the kind of tube cake pan I used. It has two pieces which makes it simple to remove the cake. Gently loosen the sides with a knife, then lift out the middle piece. 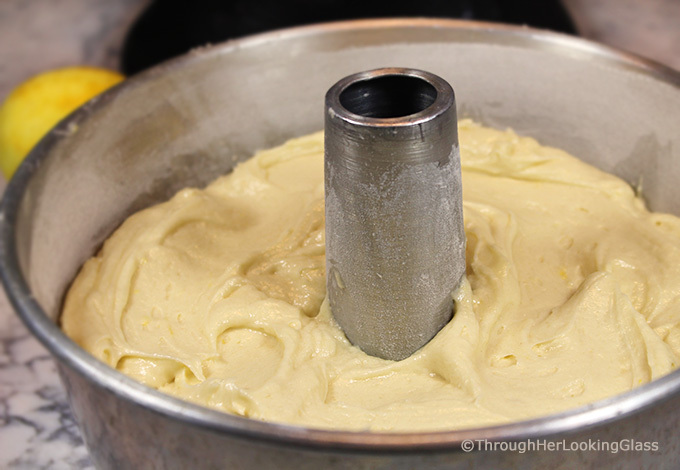 Then run your knife around the center tube to loosen, and between the bottom of the cake and cake pan to separate. 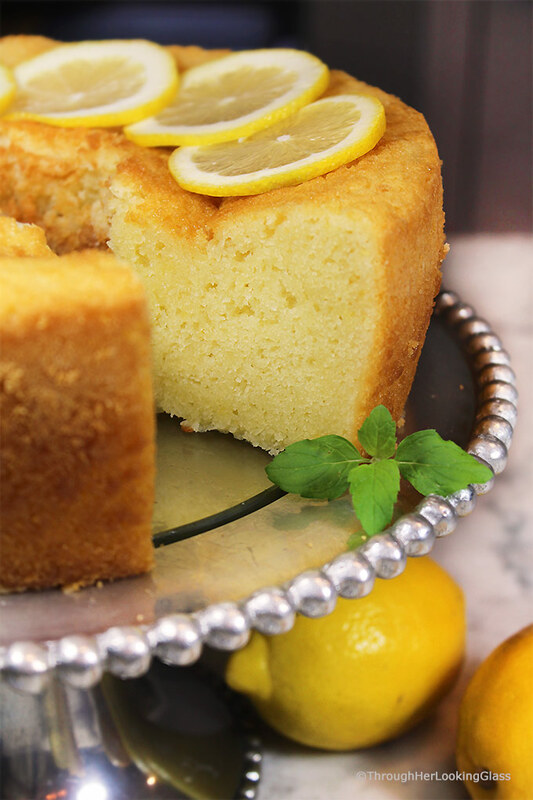 If you’re a lemon lover like me, you’ll also enjoy these other mouthwatering recipes incorporating fresh lemons: Lemon Cake, Lemon Crumble Breakfast Cake and Lemon Yogurt Breakfast Cake (Ciambella). Grease and flour a tube pan (angel food cake pan) or Bundt pan. Set aside. 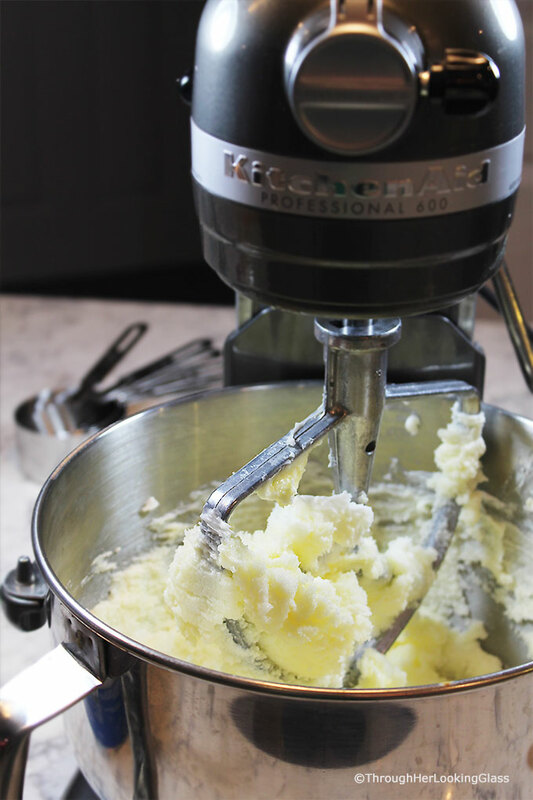 Using an electric or stand mixer, cream together butter, shortening and sugar. 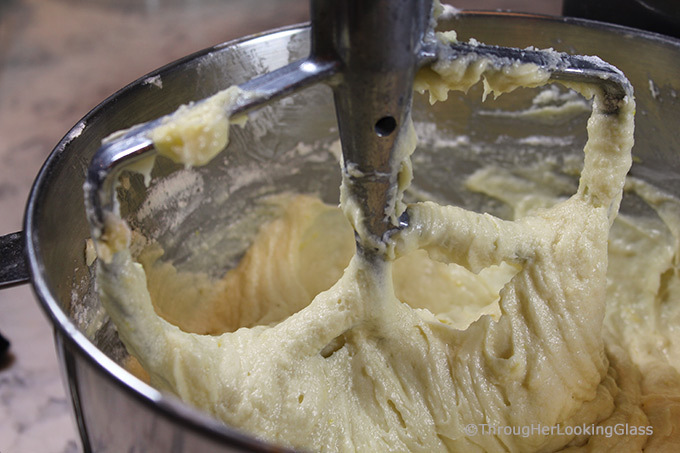 Add dry ingredients in three additions to butter mixture alternately with half of the milk, beginning and ending with flour mixture. Gently stir in lemon juice and zest. Using a sharp knife, gently separate cake from cake pan edges wherever you can, including around the center tube. Turn cake out onto rack. Serve with a dollop of fresh whipped cream or a spoonful of lemon curd. Allie, this looks SO delicious! 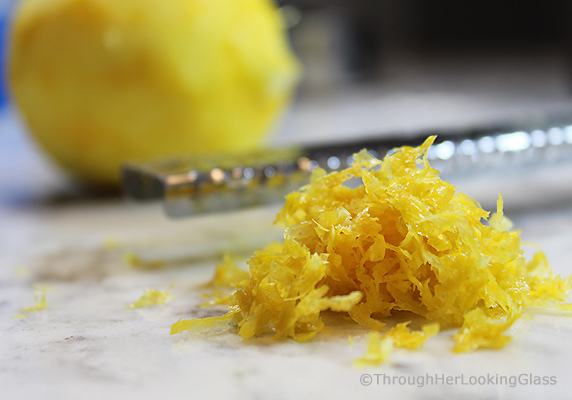 I can smell the lemon zest, now! Thanks for sharing this recipe. I will have to give the cranberry a try, too! 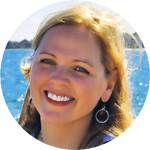 I just realized after I changed my blog name and email address, I forgot to go back and subscribe to THLG. I have subscribed with my new email now so I will get every post again. I don't want to miss it! Oh my word this looks delicious!!! I’m a sucker for anything lemon so I can’t wait to try this!! So many practical and valuable hints for successful baking. I’m one to frequently open the oven door while baking—now I know why my cakes are less than voluptuous! Thanks for all the great tips! I was thinking this cake was somehow going to have Ritz crackers in it. No matter, I want this cake! This cake was delicious I made it twice and added lemon glaze to top it off. So glad you you made this!!!! Thanks so much for dropping by Shelia, and Happy New Year! SO glad you enjoyed it! Just a little background on the recipe, it isn't the really the 1920 Famous Ritz Carlton Lemon Pound Cake. I got the recipe at a cooking school held at the Amelia Island Ritz Carlton in 2011. Someone on Pinterest made up the 1920 bit. Sounds good, but unfortunately it isn't true. It is still a wonderful pound cake. 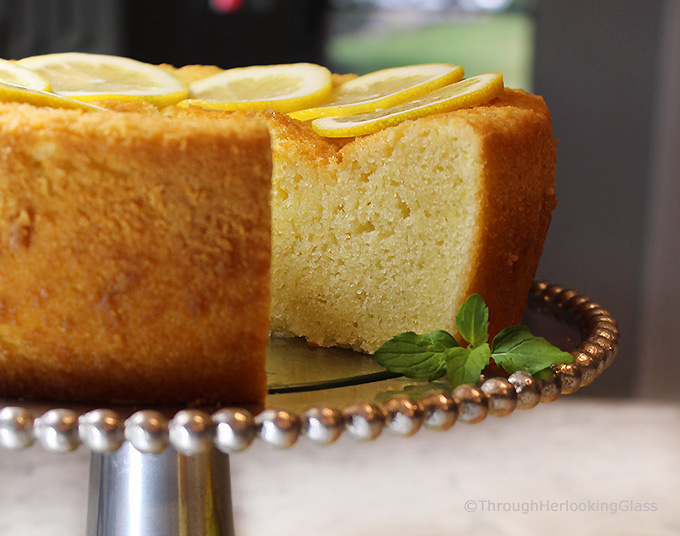 It has been my go-to pound cake since I got the recipe. Hi Stephanie, so glad you dropped by. I didn't get the recipe from your site, but thanks so much for this great information and I'll definitely pop by your site. I've been to Amelia Island and it's beautiful, lucky you to take classes there. Happy New Year! I made this cake today. I was trying out my new convection oven. It was a golden brown when I took it out and tested with toothpick. When after about 3 minutes on cooling rack it sunk! What did I do wrong? Maybe convection baking is different? Oh how disappointing Debbi. I'm really sorry to hear that, so frustrating. Yes, a convection oven definitely cooks differently. I always use a regular conventional oven for baking unless the recipe specifically calls for a convection oven. You have to adjust the cooking time and temperature if you use a convection oven for a recipe that is written for a regular oven. Here is an article about how to convert recipes for use with a convection oven. https://www.gourmetsleuth.com/articles/detail/convection-cooking-adjustments I have had some success converting cake recipes myself, but a few times I have had the same experience as you using a convection oven, even when I was following the conversion directions exactly to a T. Supposedly a convection oven cooks things more evenly, that is what I have been told, because there is a fan involved and the air is being circulated around for a more even temperature. One other thought about what happened, is that your oven may not be calibrated correctly. Especially if it is new. I have a new double oven and the top oven cooks things perfectly and the bottom oven seems to run about 25 degrees hot, maybe even a little hotter. The manual of your oven should tell you how to calibrate the oven to make sure it is truly cooking at the temperature you set it. You can buy an oven thermometer very inexpensively that will tell you what temp. the oven actually is. If you're interested in using your convection oven to make another cake, I have a great recipe that gets rave reviews that is written specifically for a convection oven, The Famous Brick Street Chocolate Cake. Here's the link: https://www.throughherlookingglass.com/brick-street-chocolate-cake/ Hope you enjoy and good luck!!! !